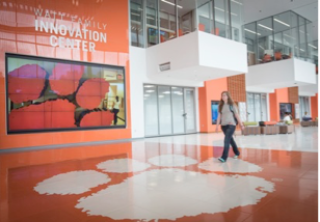 Planar has become the first Sustaining Innovation Partner for Clemson University’s Watt Family Innovation Center with a gift-in-kind of more than $1 million worth of display technology. Planar supplied the Watt Center with 191 large format, high resolution interactive LCD displays and 12 LCD video walls, including the video wall in the auditorium. It is one of the largest interactive LCD video walls the company has implemented. Planar displays are front and center in the building’s main lobby. Each classroom, hallway and study space throughout the building features Planar LCD displays that can be used by students and teachers for formal or spontaneous collaboration. The Watt Center, a highly-flexible facility in the center of campus behind R.M. Cooper Library, was designed to be an innovative hub where students, faculty and industry partners will collaborate, create, innovate and communicate, using state-of-the-art technology and interactive learning systems. Planar designs and manufactures display and digital signage solutions including video walls, large format LCD displays, interactive displays and other display solutions for large-scale data visualization. The company, headquartered in Oregon, is a wholly-owned subsidiary of Leyard Optoelectronic Co., Ltd.